As an NTP one of the services I offer is my Customized Supplement Service. For $50.00 I create a recommended supplement protocol that is tailored to you specifically. * When you purchase this program, I send you an extremely in-depth questionnaire which I then use to create supplement recommendations for you. I will send your specific supplement recommendations to you via Fullscript where you can order the products directly. For more information on my Customized Supplement Service click HERE. 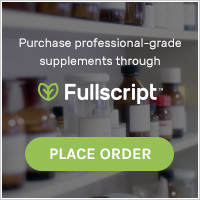 I teamed-up with Fullscript to offer my clients the ability to purchase high-quality supplements directly. Counterfeit supplements have become a huge problem in the online marketplace, which makes it extremely important to order your supplements through a trustworthy source. All products in the Fullscript catalog have zero markup which means they are sold at MSRP or lower, with no additional customs or duties to worry about! Click HERE to access my Fullscript dispensary. I have also partnered with Microbiome labs who are the makers of my favorite gut health products. You are now able to buy directly from Microbiome labs through my dispensary. For those of you who do not regularly take probiotics, I encourage you to start with a bottle of RestorFlora. Once you complete the bottle you may upgrade to the MEGAsporebiotic. Click HERE to access my Microbiome Labs dispensary.